A-HOTEL.com - Luxury and cheap accommodation in Shankhay, Russia. Prices and hotel, apartment booking in Shankhay and surrounding. Situated in Petropavlovsk-Kamchatskiy, Guest House Avrora offers barbecue facilities. 20 km from Tsentral'naya Sports Centre Ski Lift, the property is also 21 km away from Krasnaya Sopka Ski Lift. Featuring a shared lounge and free WiFi, Kamchatka Hostel Green Point is set in Nagorny. The accommodation features a shared kitchen, valet parking and luggage storage for guests. NEOTEL` is offering accommodation in Nagorny. Featuring a shared kitchen, this property also provides guests with a terrace. Апартаменты на Савченко 15 in Petropavlovsk-Kamchatskiy offers accommodation with free WiFi, 9 km from Edel'veys Ski Lift 1 and 9 km from Edel'veys Ski Lift 3. The property is 10 km from Edel'veys Ski Lift 2. Located 9 km from Edel'veys Ski Lift 1 and 9 km from Edel'veys Ski Lift 3, Bagira Apartment on Larina 29 provides accommodation situated in Petropavlovsk-Kamchatskiy. Guests staying at this apartment have access to free WiFi and a fully equipped kitchen. 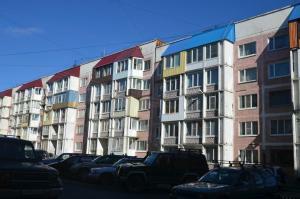 Set in Petropavlovsk-Kamchatskiy, Master of Kamchatka offers accommodation with a balcony and free WiFi. The property is 8 km from Edel'veys Ski Lift 1.